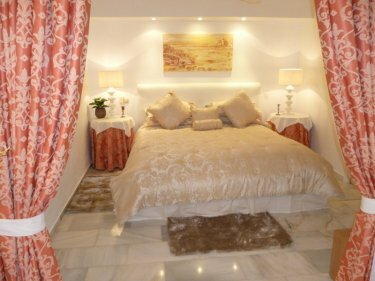 *NEW FOR 2012* Casa Lillie is a superb luxury 2 bedroom apartment conveniently located within 15 minutes walking distance to Puerto Banus Marina and beaches. Sleeping up to 6 this very large apartment offers exceptional value for money. 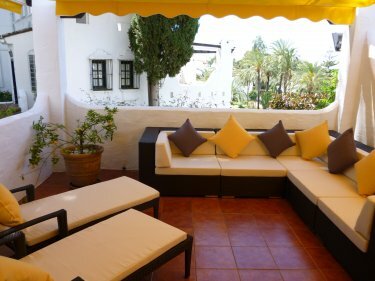 This superb south west facing apartment is furnished to the highest standard and is situated within beautiful landscaped gardens with sea views in the award winning Aldea Blanca Complex. The complex is gated with 24hr security and features four swimming pools, jacuzzi�s, beautifully maintained gardens and terraced areas. The Central Plaza complex with its shops, bars and restaurants only a 5 minute walk away. Puerto Banus Marina and its beaches are just a 15 minute stroll away making Aldea Blanca one of only a few quality complexes in Marbella where a car is not essential. The dining area is situated at the rear of the lounge area and features a large modern glass and crome dining table with 6 chairs and is complemented with a matching sideboard. The spacious and well appointed master bedroom features a super king sized bed with a tempur mattress for added comfort. A large walk-in wardrobe provides generous storage space with drawers. For your enjoyment a flat screen TV is provided with Sky freeview channels. Adjoining this bedroom is a seperate area featuring a double sofa bed for the 5th and 6th guests. The second large guest bedroom has comfortable twin beds which can be converted to a superking sized bed on request. This room again features its own walk-in wardrobe with hanging space and drawers and a flat screen TV with Sky freeview channels. Only quality bed linen is provided for your added comfort. The large Master en-suite bathroom is fully tiled in marble and features a double walk-in shower, marble topped vanity unit and hairdryer. The 2nd family sized bathroom can be accessed from the hallway and can also be accessed directly from 2nd bedroom. Features include a large Jacuzzi bath, seperate walk-in shower, wc, and a marble topped vanity unit with hairdryer. Quality towels are provided on a weekly basis. Beach towels are also provided with portable sun loungers for the pool areas. The fully fitted kitchen is well equipped with fridge/freezer, dishwasher,built-in electric oven and microwave and a seperate glass hob, Kettle, toaster, Coffee maker and juicer. The separate laundry room is next to the kitchen and includes a washing machine, dryer, iron, ironing board and clothes rack. The kitchen is exceptionally well appointed and equipped with everything you need for an enjoyable holiday. Outside there are four large free-form swimming pools each with an adjoining children�s pool. Two of these feature outside jacuzzi's. The pools these are set within beautiful landscaped gardens facing towards the sea with plenty of terraced areas for sunbathing. The nearest pool is situated just yards away. You will be provided with a gate key which allows you access to all external gates throughout the urbanisation allowing convenient accessibility to the nearby shops, bars and restaurants. Casa Lillie enjoys a perfect location for peace, relaxation and convenience. 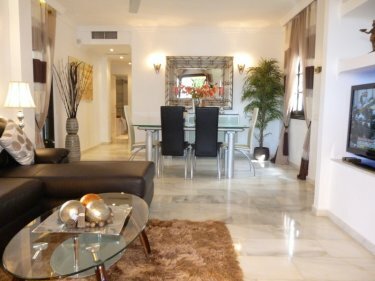 Set in the large subtropical gardens and swimming pools of the exclusive Aldea Blanca complex in the area of Nueva Andalucia and only 15 minutes walking distance of the marina and beaches at Puerto Banus. A very short stroll away is the Centro Plaza Shopping Centre where there is a Supersol Supermarket, a large number of shops and quality restaurants, banks, car hire, a gym and much more. Again, just a short walk away is the Hotel Andalucia Plaza, the Casino and many more shops and quality restaurants. Recently decorated and furnished to the highest standards this very large apartment is fully equipped in every way to provide a true home from home experience. * Separate study with sofa-bed adjoining the Master bedroom * 2nd large en-suite bedroom, with its own walk-in wardrobe and Flat screen TV. 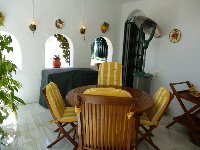 * Large South West facing furnished sun terrace overlooking the pool area towards the sea. * Fully fitted and equipped kitchen. * Seperate laundry room with Washing machine and Dryer, iron and ironing board. * Hot and cold Air Conditioning throughout. * 4 Swimming pools, some with Jacuzzis and children's pool. * Double glazed windows and doors. * Gated complex with 24 hour security. A 30% non refundable deposit is payable by bank transfer in sterling on booking. The remaining balance is payable 90 days prior to arrival also by bank transfer. An additional �300 damage deposit is also payable in sterling on arrival. This is refunded on the day of departure after an inspection of the property.Please note that prices quoted are for 4 persons. An additional charge of �100 per week per person is applicable to the 5th or 6th guest. Please note that prices quoted Full terms and conditions can be provided on request. Apartment Services: *Bed linen change and cleaning is provided on a once weekly basis. *A mid week clean is available at an additional charge of 60�. *Bathroom towels and beach towels are provided. *4 portable sunloungers are provided for the pool/ garden areas * A welcome pack of essential food items can be supplied on request. A bespoke shop can also be arranged prior to arrival. Please ask for details and costs. * Airport pick up and drop off can be provided at a cost of 65� each way. (subject to availability). * A baby cot and high chair can be supplied on request. * Your locally based hosts will greet you at the apartment on arrival and are contactable in case of an emergency. Additional information: Please note that smoking is not permitted inside the apartment. However, smoking IS permitted on both terraces. Long term rental may be considered during the winter months.